I wonder if Kiwi is suffering from 'Royal Baby fatigue' already - I know I am. We have a monarchy, SON. Like it or lump it, they are the centre point of our nation. They have been there since Adam was a lad (at least since Canute, Harold, William and all those). Mock it and denigrate it as you will but it has made us the nation (or nations) that we are. 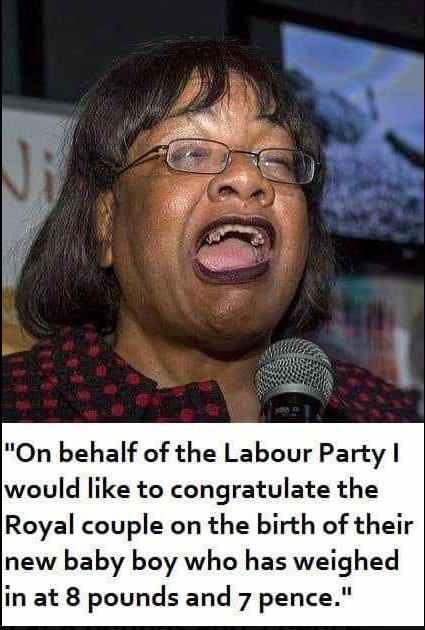 I don't think President Dennis Skinner and his Consort, Diane Abbott, has the same ring about it - do you? God help us. Don't get me wrong, I'm a staunch monarchist but gizzabreak fer crying out loud it's not like it's their first ikkle rugrat, the announcement clogged up the morning news here and to top it all off NZ's PM of the MP's is up the duff and about to drop. Well - as I've said before on here, the 3 topics I wont debate in public are politics, religion and royalty because it's the quickest way to lose friends and I consider that we are all friends on this forum. Sleep well, sleep tight, mind the corgis don't bite - Oops forgot the last one just died! Of course we can continue to debate these topics (what has being in public or otherwise got to do with it?) We don't need to insult each other. Our views are personal but we shouldn't feel that we can't air them. I absolutely 100% agree but I've seen it happen twice on this forum - that's one reason why things are much quieter than they used to be so I don't want to go there. Now, if anyone wants to talk about the price of eggs ...........! Free Range, Barn or Cage ?? Why are you frightened of politics, royalty and religion, SON? We all have a view, don't we?